I hope everyone had a wonderful Thanksgiving 2016, and if you’re headed out to the Black Friday sales, that you find some great deals. If you’re still looking for gift ideas after Black Friday, be sure to keep an eye on the site. We’ll be doing INTJ gift ideas throughout the month of December. Hold on though, it’s not December yet. We’re working our way through the dreg ends of November, and today is our last sweet potato recipe. You may remember the Always Uttori Blog Takeover by Girl + Food. The recipe for the takeover was Brie and Apple Fritters. 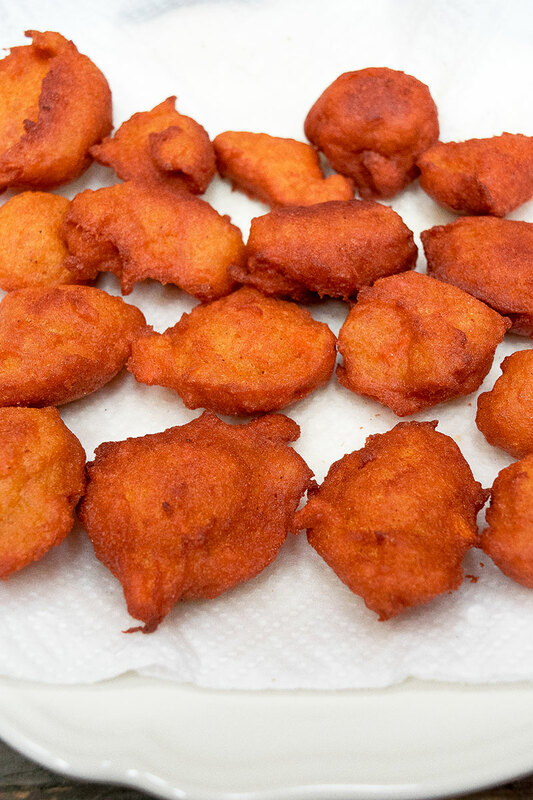 Let me tell you, those fritters were delicious. If you’re interested in trying the recipe, you can find it HERE. 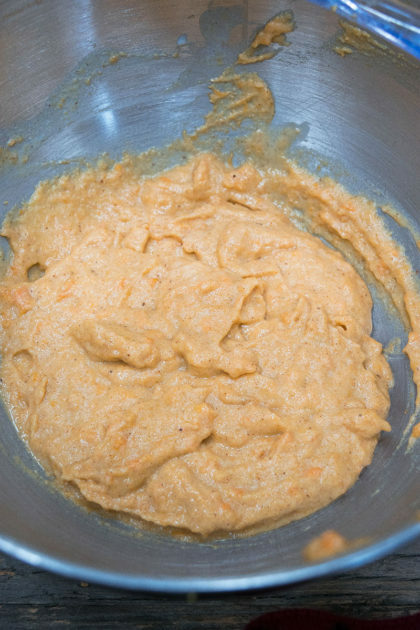 As you know, sweet potatoes are a favorite of mine, so, as much as I loved the apple brie version, I decided to create a recipe using sweet potato as the base flavor. I loved the results, and I hope that you will too. 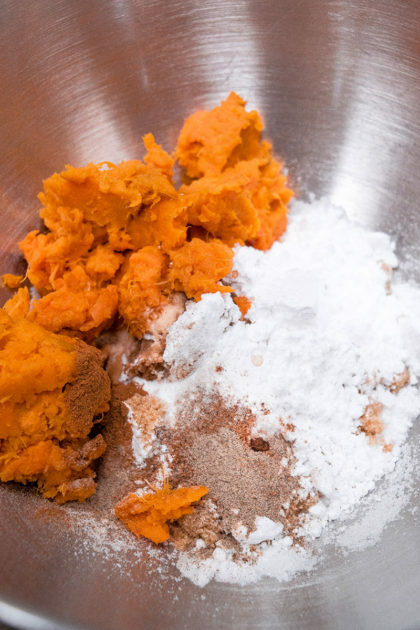 This recipe is great if you have any leftover sweet potatoes from Thanksgiving. 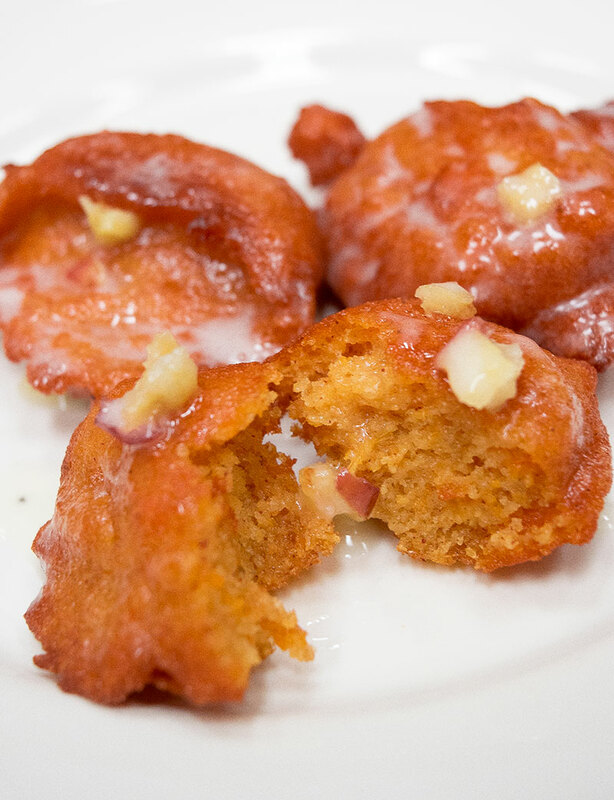 Sweet potato fritters are the perfect cool weather treat! They are crispy, chewy, and have a delicate sweet potato flavor. Very yummy! It’s like saying goodbye to November all in one bite. Peel and rinse a large, sweet potato. Boil in a pot or water or steam in the microwave for about 8-10 minutes. Once cooked, mash the potato. In a stand mixer, combine the potato, rice flour, baking powder and salt. Mix until combined. Add the egg, confectioners and brown sugars, cinnamon, nutmeg, cardamom. Mix until combined. Finally add the milk and vanilla. Mix until combined. The batter should be about the consistency of pancake batter, loose, but thick enough to hold shape. Heat about ½ c of oil in a deep pan over medium heat. The oil is ready when you stick a wooden skewer or utensil in and bubbles form around it. 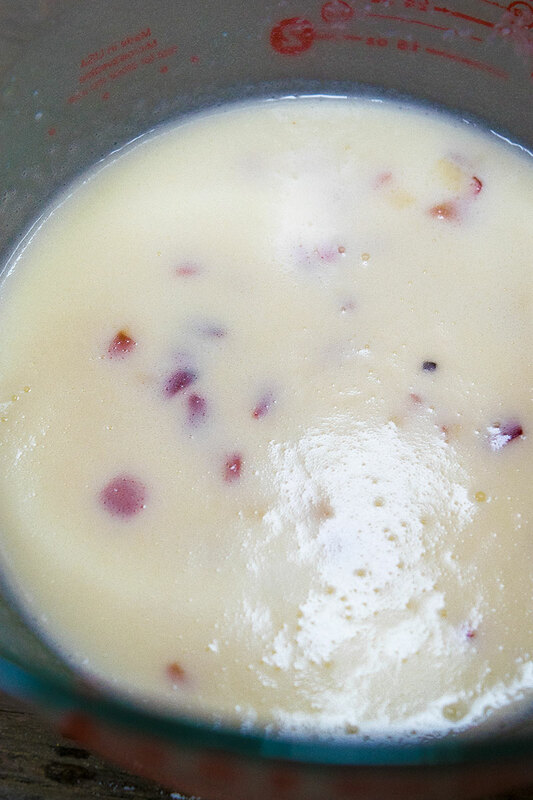 Using a spoon, slide about a tablespoon worth of batter into the oil. Let cook. 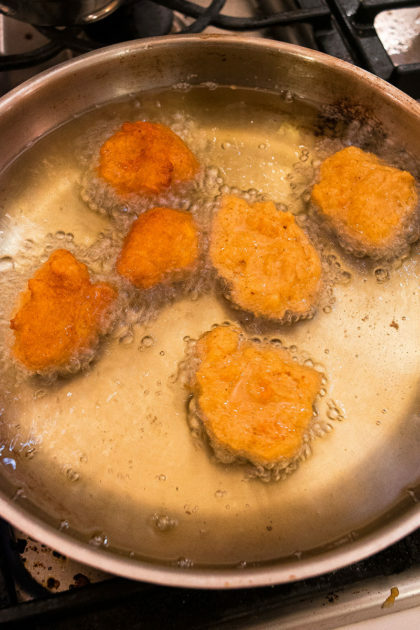 You may have to gently press on the base of the fritter to release from the bottom of the pan after a few minutes. When the fritters start floating, turn. Turn an additional one or two times to ensure even cooking. Let cook for about 5-8 minutes, or until golden brown. Place on a plate covered in paper towels. Glaze and enjoy. These are best eaten as soon as possible, but they’re still tasty when cooled. 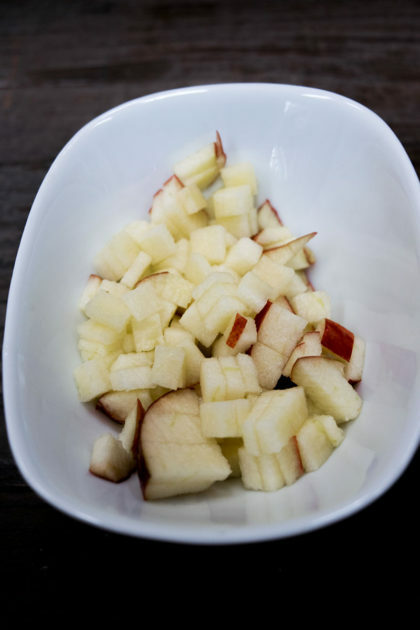 Dice the apple into very small chunks. Microwave for 40-60 seconds, or until the apples are cooked and tender. Drain any water released by the apple chunks. In a medium bowl, add ¼ c + 2 TBSP of milk to 1 cup of powdered sugar. Whisk until there are no lumps. Add the vanilla and apple chunks, if using. 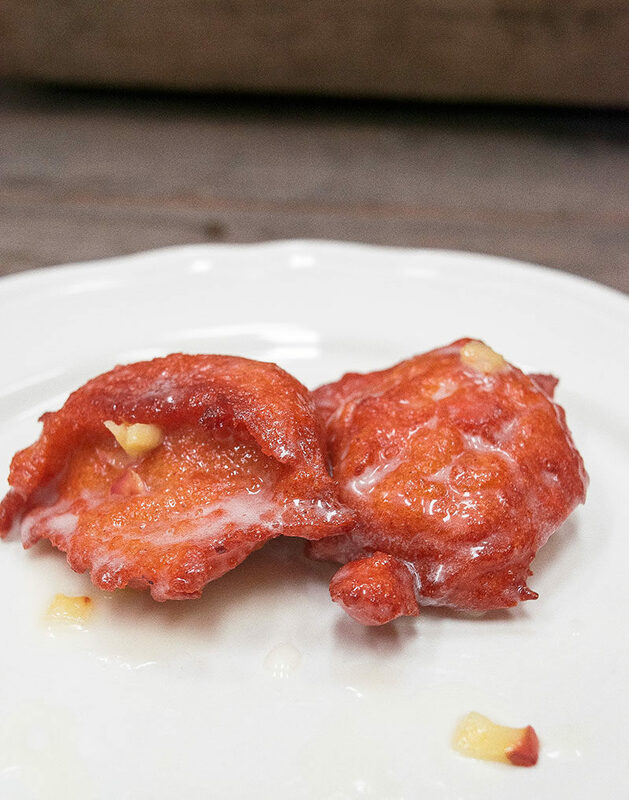 Either drizzle the glaze over the fritters, or submerge the fritters fully in the glaze using a slotted spoon. You can let the glaze harden a little, or eat right away. These fritters also taste great without glaze! However you wish to eat them, enjoy! I also hope you have enjoyed some of the sweet potato recipes I’ve shared over the past month. If you make any of these recipes, feel free to use #uttorifood on social media to share your creations.